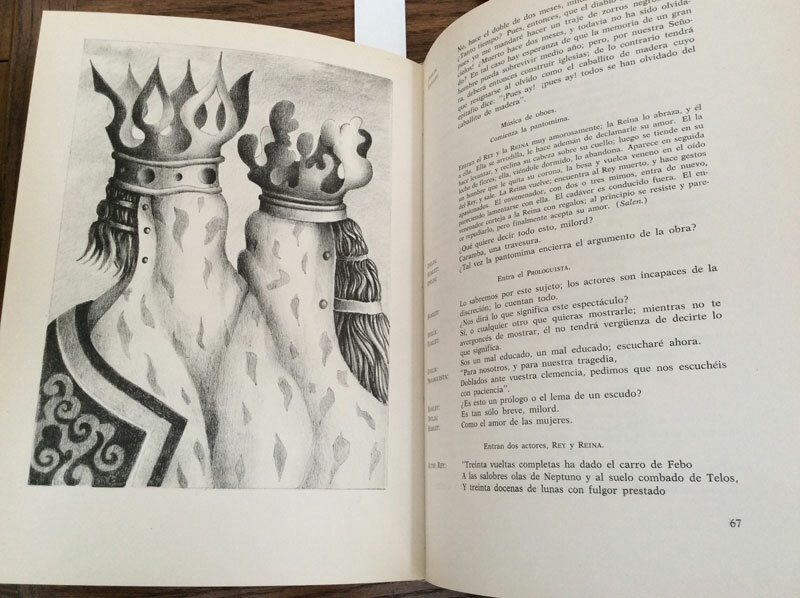 The poet and critic Rafael Squirru (1925-2016) and the artist Juan Carlos Liberti (1930-) collaborated to create Argentine translations of Shakespeare’s plays, illustrated with captivating surrealist images. The Folger’s vaults contain a copy of the duo’s Hamlet (1976), signed and donated by Squirru himself. 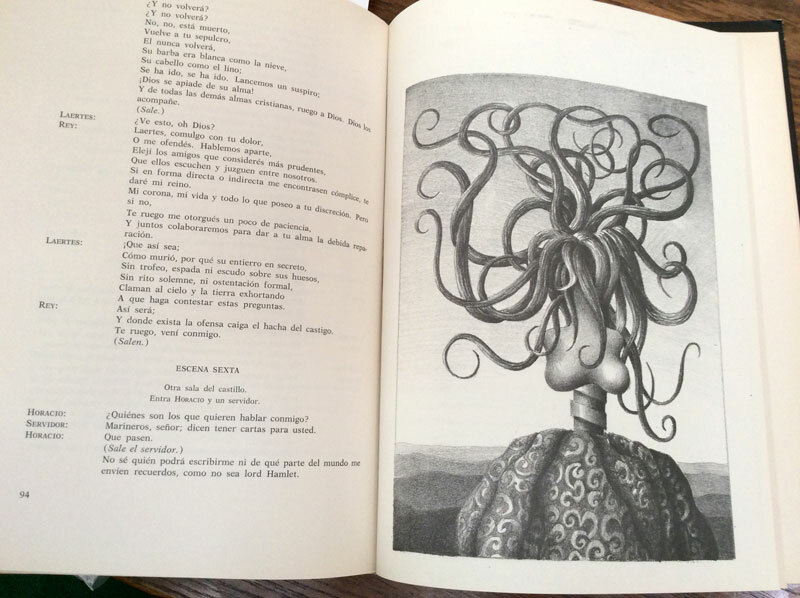 This Argentine translation updates Luis Astrana-Marin’s Spanish translation of the play, published in Madrid in 1949. Squirru adapts the text specifically to suit ‘the Latin American ear’, as he writes in the introduction, since the Spanish spoken in Spain and the Spanish of Argentina are distinct in accent, vocabulary, and rhythm. The ruff and the facial hair cut an unmistakable Shakespearean silhouette, and the W and S on the clothing leave no doubt of the figure’s identity. 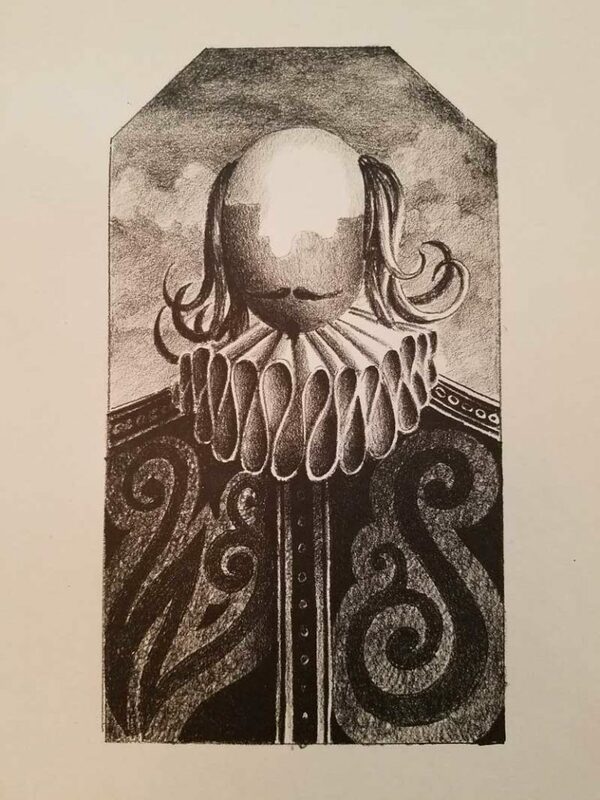 The blank facial features suggest Shakespeare’s anonymity, reminding us of our scarcity of knowledge about the playwright. The figure is mannequin-esque, implying the tendency to display our own designs, and to project our own problems and circumstances onto the model of Shakespeare’s plays. Though the illustrations are unlabelled, the characters can be distinguished through their personality traits. 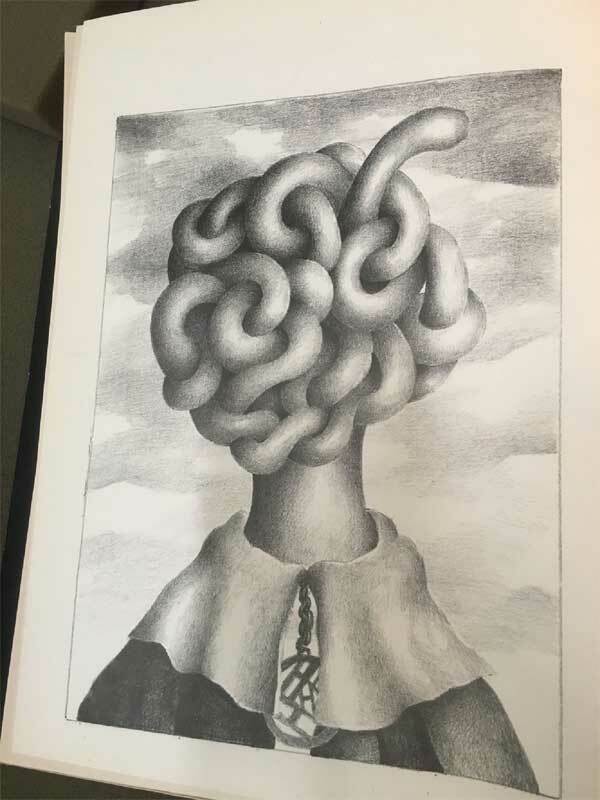 With a brain in the place of a face, this image portrays a man overwhelmed by the weight of his thoughts. Yet, a part of his cerebral matter extends outwards, snake-like, playing mischief with the brain’s form and function, suggesting over-thinking and indecision. The pendant hanging from his neck is composed of a series of the letter ‘H,’ marking Hamlet’s obsession with the self. Liberti illustrates Ophelia’s declining mental state; of course, ‘madness in great ones must not unwatch’d go’. In Act 2, Scene 1, this image shows a neatly turned out woman, and astute viewers will notice that her body is formed by a screw, which holds her together and suggests the prospect of her being used as a tool by those around her. Compare this image to the illustration in Act 4, Scene 6, in which Ophelia’s hair is flailing wildly above her head. The screw has turned. She has been twisted, and this wrenching of the screw presents a visualization of her inner turmoil: ‘divided from herself’. Ophelia’s singing in Act 4, Scene 5, demonstrates the skill involved in Squirru’s translation. Squirru not only maintains the rhyming pattern of Shakespeare’s text, but also regulates the cadence into 9 beats per line. KING: How are you, pretty lady? KING: How do you do, pretty lady? In Squirru’s version, the King seamlessly continues Ophelia’s song, implying the King’s complicity in Ophelia’s madness and perhaps evocative of Claudius as equally unstable. Brutal and unstable leadership takes on an added significance in the publication year of this edition of Hamlet, as this period of Argentina’s history is marked by repressive and volatile governments. (In 1976, the president, Isabel Perón, was overthrown by a military junta in a coup d’état). The image that accompanies the text of Act 3, Scene 1, is a scene in the castle in which Claudius sends Gertrude away, as he plots to spy on Hamlet. The two characters in the illustration wear long veils, strapped to their heads, on top of which their crowns sit. The veils highlight the deception, corruption, and manipulation of the characters, hiding their true agendas and emotions. Gertrude’s crown is made up of curved, voluptuous shapes, alluding to her femininity. Claudius’ crown is formed of sharp blades, a visible hint of his murderous ways and his ‘foul play’. 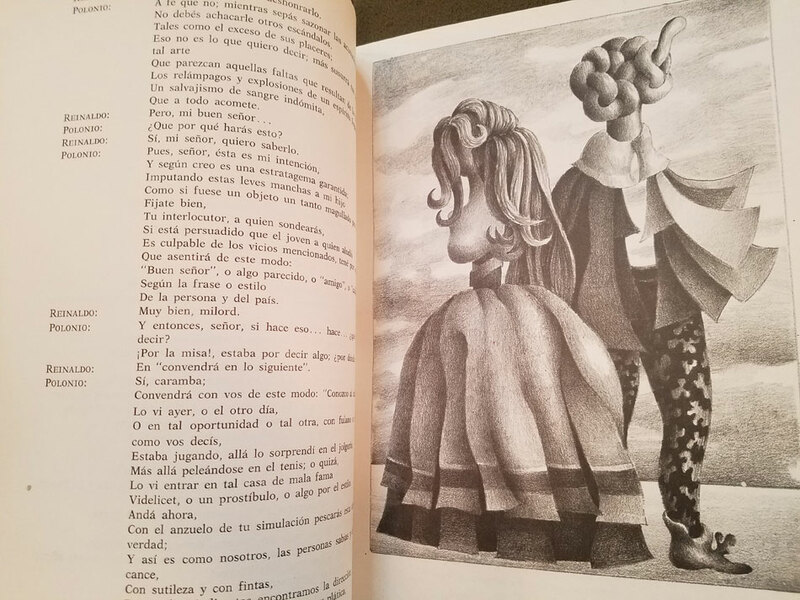 As we’ve seen from these examples, Liberti’s faceless, surrealist illustrations act as artistic riddles, complimenting Squirru’s translation of Hamlet. Squirru and Liberti’s Hamlet exhibits the evolving potential for playful and creative perspectives on Shakespeare’s work, dressing Shakespeare, the world’s mannequin, in Argentine clothing.